There are few things worse than living in a home with excessive moisture, mold, dust mites, and a foul musty odor. Thanks to the Luoyiman Dehumidifier Electric Portable Air Dehumidifier, you can get all those problems under control. This dehumidification system might only measure 12 by 5 by 6 inches and weigh just 2.2 pounds but do not let that fool you. Designed with the Peltier technology, which eliminates the need for a compressor, this unit offers quiet and powerful performance. For small areas, like closets; kitchen or bathroom cabinets; armoires; and even cars, boats, and RVs, you will love the results this dehumidifier produces. With incredible versatility, the Luoyiman Dehumidifier is the perfect choice for all types of situations. For people with respiratory problems, such as allergies, asthma, COPD, and others, eliminating excess moisture, bacteria, fungus, mold, dust mites, and mildew makes life so much better. Ultimately, this dehumidifier creates a healthier home or work environment. However, this unit is also perfect for extracting moisture caused by different situations. For instance, it works great for basement leaks; undercabinet drips in the kitchen or bathroom; or excess water in cars, boats, trailers, and so on. For anyone who wants to protect their possessions and improve indoor air quality, the Luoyiman Dehumidifier is a perfect choice. Capacity – With a 17-ounce (500-millimeter) removable water tank, this dehumidifier is ideal for smaller rooms and spaces. 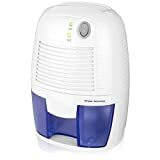 For bedrooms, kitchens, baby nurseries living rooms, basements, bathrooms, closets, meeting rooms, and offices, as well as vehicles with 110-power outlets, you cannot beat what this dehumidifier provides. Please note that for the best performance, you should run this unit under optimal conditions of 86 degrees Fahrenheit (30 degrees Celsius) and 80 percent relative humidity. Advanced Design – In addition to a sleek exterior design, the Luoyiman Dehumidifier features the Peltier electrothermal cooling technology. With an extremely quiet operation, this dehumidifier is ideal for nurseries and bedrooms. Due to the high-end ABS materials, you can expect a flawless service time after time. The Luoyiman Dehumidifier is easy to use. After connecting the power adapter to the unit and then the power outlet, switch the dehumidifier on using the ON/OFF switch. At that time, the green LED indicator light will illuminate. While running, you can expect to feel a light breeze coming out of the dry air outlet. To shut the machine off, simply press the off button on the ON/OFF switch. Keep in mind that this dehumidifier also has an automatic shutoff feature. Once the tank fills, it turns off by itself. Once the 17-ounce (500-millimeter) tank fills to the top, the green LED indicator light turns yellow, followed by the dehumidifier shutting off automatically. Even then, be sure to press the OFF button. With the unit off, first pull out the water tank and then the rubber plug located on the water displacement hole. Next, empty the tank, allowing the water to drain from that hole. When finished, put the rubber plug back in, and slide the water tank into place. Once completed, the dehumidifier is ready for future operation. As for cleaning the Luoyiman Dehumidifier, always confirm you set the ON/OFF to OFF before unplugging the electrical cord from the power outlet. Then, using a soft, clean cloth, wipe off any surface debris or dust, as well as inside the air inlets. Because of its design and performance, you would have a challenging time finding another dehumidifier like this one. However, if you need something that covers slightly more square footage and that you can discreetly place flat to the wall, you should consider the Hodgson Auto Small Dehumidifier. With a large portable water tank and the thermoelectric technology, this product will provide more coverage and a quiet function. With the availability of the Luoyiman Dehumidifier, there is no reason to live or work in an unhealthy environment. After just one continuous 24-hour run, you will notice a dramatic improvement in the smell and moisture. Even when dealing with moisture inside a vehicle, by using the 110-volt plug-in or a safe extension cord, you can eradicate the problem. How long should a Dehumidifier run per Day? What are NOAA Weather Radio Frequencies? Air Purifier For Allergies Do They Work? Some recommended products may use affiliate links. FreshAndBreezy.com is a participant in the Amazon Services LLC Associates Program, an affiliate advertising program designed to provide a means for sites to earn advertising fees by advertising and linking to Amazon.com. Amazon and the Amazon logo are trademarks of Amazon.com, Inc or its affiliates. Copyright © 2019 Fresh And Breezy.com | All Rights Reserved.